ePublishing Knowledge BaseePublishing Knowledge BaseePublishing Knowledge Base Creating and Managing Directories & Buyers GuidesHow do I control who receives notifications when directory listings expire? Any directory listing that has a Pull Date and Time will be automatically removed from the website at that date and time. Based on your system settings, your website will automatically send a reminder email to the directory listing owners based on the users associated with those directory listings. It will also send a notification to someone in your organization based on the directory.contact.email system setting. The website will send a reminder email to directory listing owners based on an individual listing's associated users. Open your Directory Listing in the Directory Listing Manager under Sales/Marketing. Zoom: The website will send a reminder email to directory listing owners based on an individual listing's associated users. To add users to a directory listing, click Search for Users. Select a box next to a user, and click Confirm selection (circled below). Zoom: To add users to a directory listing, click Search for Users. To remove a user from a listing, select the box next to them, and click Delete. To update the email address of the person inside your company who will receive notifications, click Edit next to directory.contact.email in your System Settings. 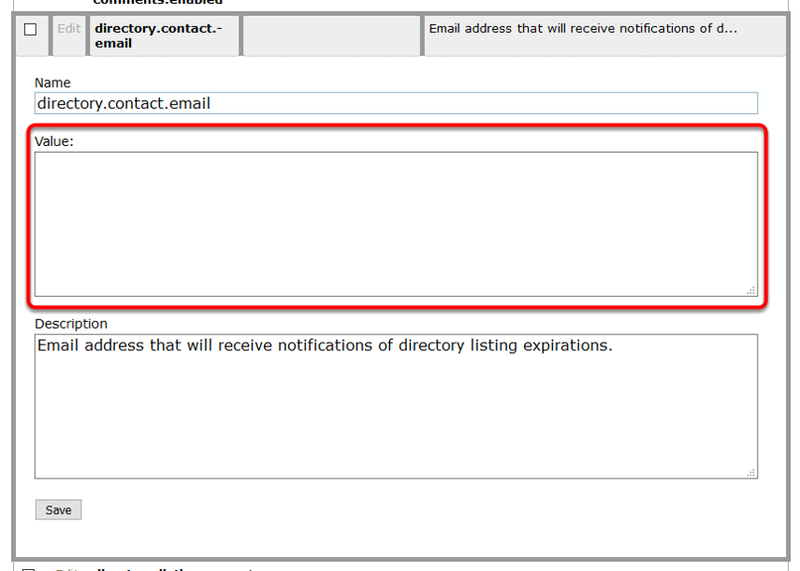 This controls the email address that will receive notifications of directory listing expirations. Update the Value with the email address you'd like to send expiration notices to internally. Zoom: Update the Value with the email address you'd like to send expiration notices to internally. Prev: How do I control who receives notifications in my company when directory listings are updated? Next: How do I delete or hide a directory on my website?